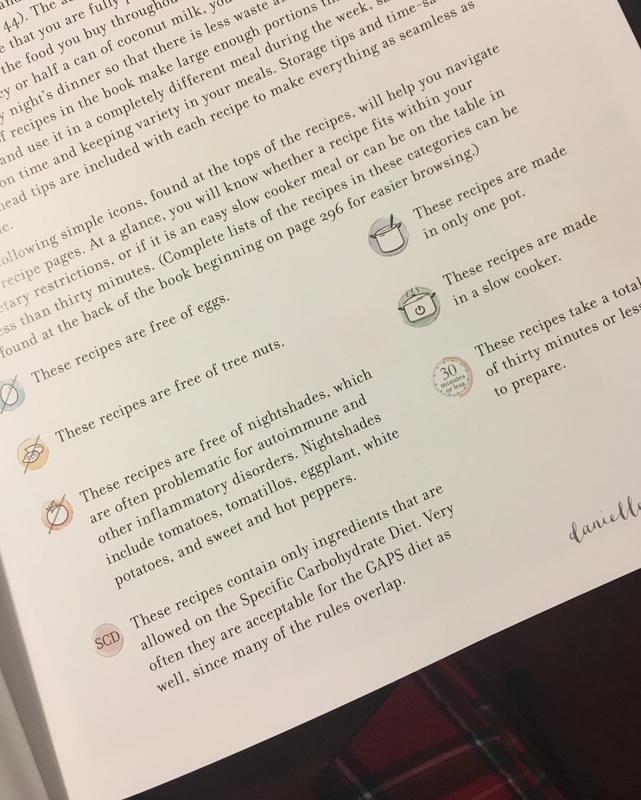 It's been a while since I've reviewed a cookbook and today I want to feature one of the recipes we recently made because it was so good! We've been on this mostly Paleo kick for a while, but sometimes I also like to stray. Because...carbs. So this recipe is totally Paleo, but can also be made not Paleo. And I'll show you both! First off, this recipe is courtesy of Danielle Walker's Against All Grain: Meals Made Simple. My siser- and brother-in-law bought me this book for Christmas and we have gotten so much use out of it! 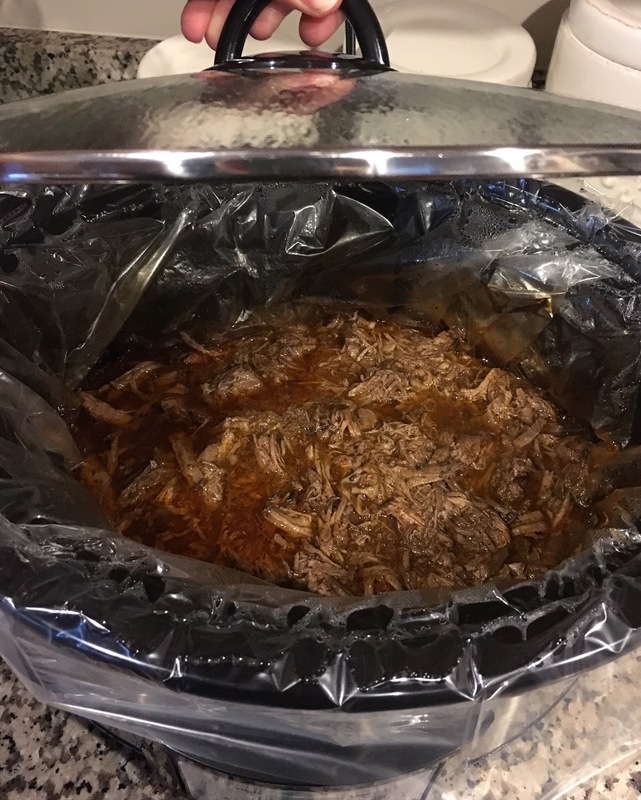 It's all about making dinner easy, so there are recipes for the crock pot, take less than 30 minutes or have make ahead options. I also love that there are plenty of tips to stretch a recipe. Cooking healthy can be a lot of work, so an author that wants to make my cooking life easier is my best friend. The coolest thing to me about this book is all the little icons that are there to help you out. Like most other Paleo books, there is a section about what foods to have on hand, meats to buy, kitchen tools to own, etc. But these icons are my favorite! You can instantly know if it's going to be a short recipe, use only one pan or make it in the crock pot. It's also really helpful for people that have restricted diets and tells you if a recipe is egg free, tree nut free, nightshade (tomatoes, potatoes and peppers) free or if it is compliant with the Specific Carbohydrate Diet. One of our family friends has to do a nightshade free diet and when I saw that icon, I immediately thought "how cool!" as those are some hard recipes to come by! This past Tuesday night, on one of my double class nights, I made the recipe Chipotle Barbacoa. The recipe will be at the end of the post. I used a 3-lb top round roast and added all of the ingredients in the crock pot. There was no browning involved (I hate browning in crock pot recipes, defeats the purpose). I woke up that morning about 20 minutes early and put everything together before I headed out the door. I came home to this gloriousness. As I was shredding the beef, I may or may not have been doing a happy dance. 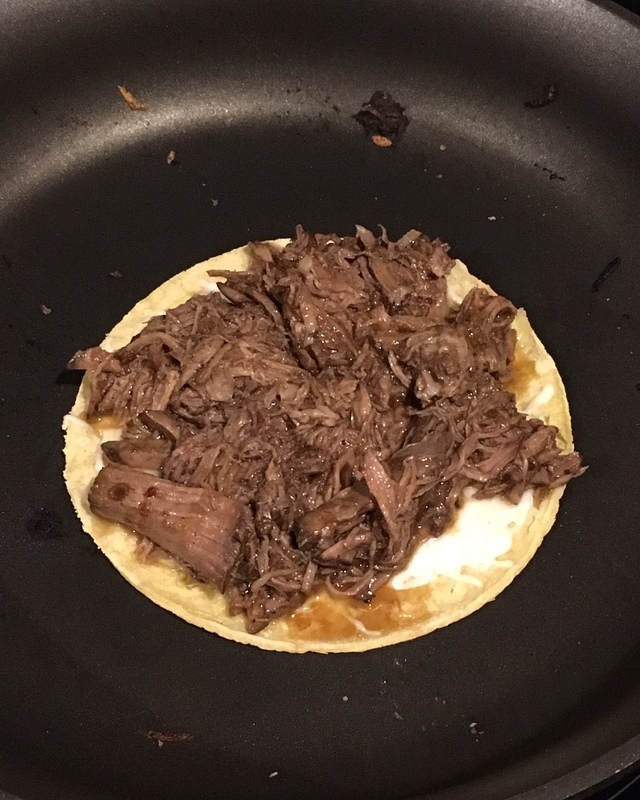 It was seriously some of the most tender beef I have ever made! That night, we did not eat Paleo. At all. 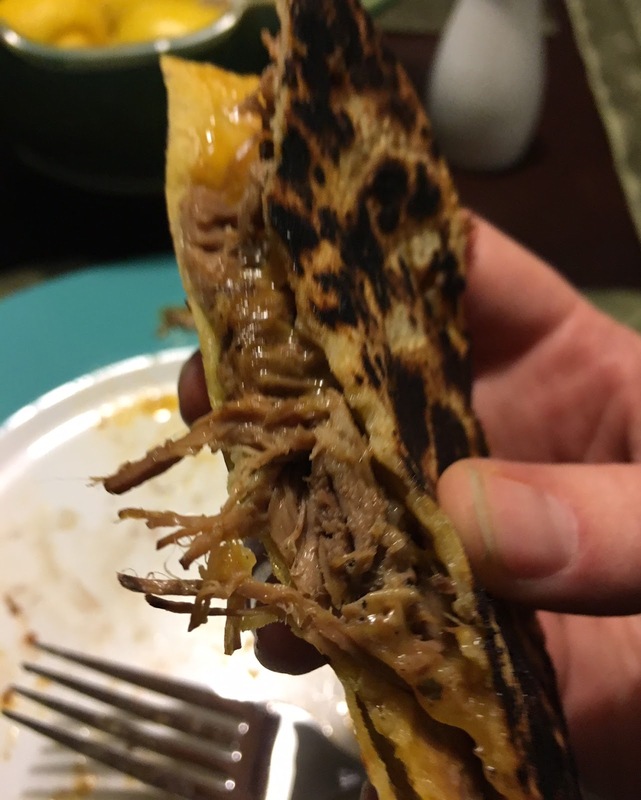 We took the Chipotle Barbacoa and made some Pioneer Woman style quesadillas. They are super simple. Heat up a frying pan. 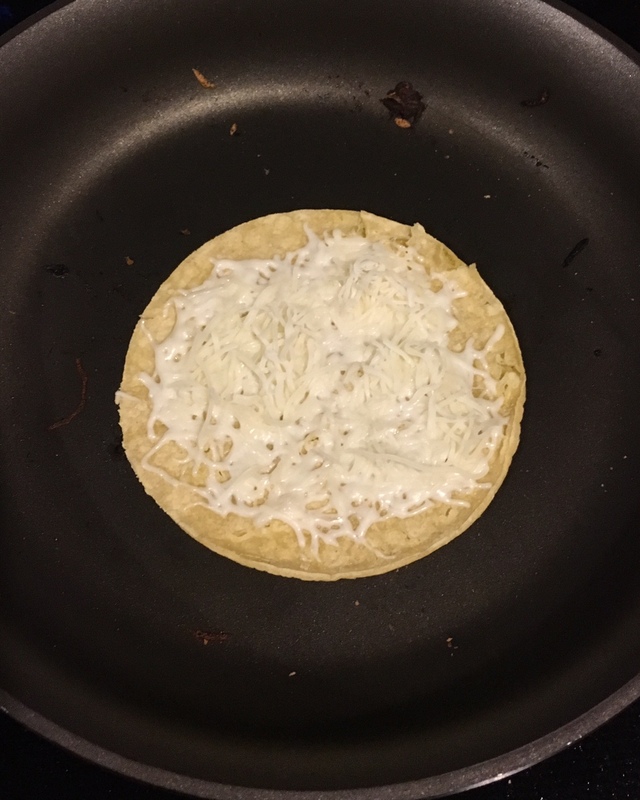 Put one tortilla down on the pan. Sprinkle some cheese on top and let it melt. Then add the meat on top, add some more cheese and put a second tortilla on top. Flip it over and let it cook a few minutes. You get this ooey-gooey goodness. See all the gooey, non-compliant cheese?! We made four more, two for each of us, for lunch the next day. I still had some meat left over, so I saved it and took it to work with me on Thursday and made a taco salad with it! I used spinach and a little cheese (not Paleo) since I didn't have any extra diced tomatoes. 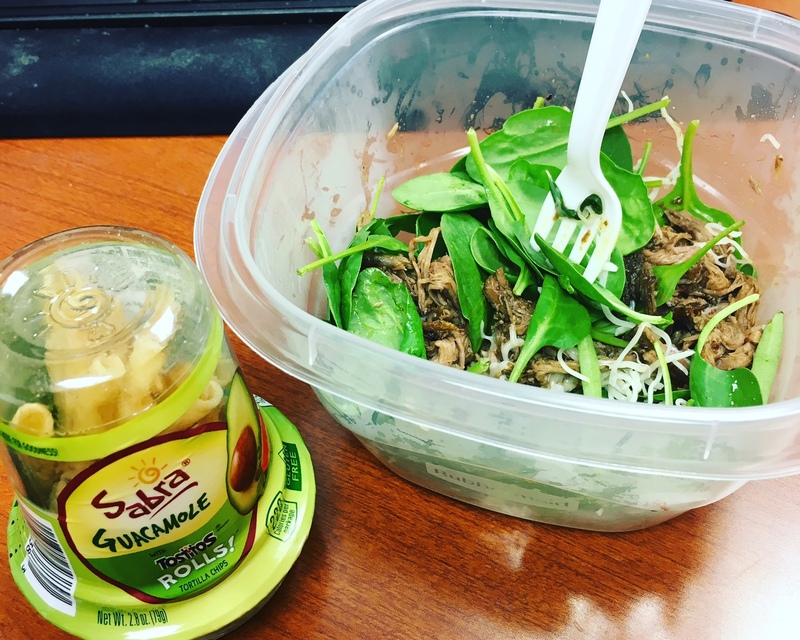 I received a free Sabra On-the-Go Guacamole for free from Influenster in exchange for my opinion, so I added that to my lunch. I ate the rolled up Tostitos chips (also not Paleo, ha) with the guacamole and used what was left on my salad. It was a great easy way to use up the meat! It's also the way that the book recommends eating it, as a taco salad! So far, this is one of my favorite books. Not just Paleo books, but cookbooks in general. The recipes are delicious and there are so many weeknight friendly options. I think almost every meal this week came out of this book. Definitely check it out if you have a chance and are doing Clean Eating or Paleo. 1. Cut the roast into 2 pieces and trim any fat. Place in a slow cooker. 2. Combine the chipotle pepper, onion, lime juice, tomato paste, garlic, vinegar, cumin, salt, oregano and cloves in a food processor or blender. Process until smooth. 3. Pour the pureed pepper mixture over the roast and add the stock and bay leaves. 5. Remove the beef and shred with 2 forks. Return the meat to the slow cooker and continue cooking for 1 to 2 hours, until very tender. 6. Serve over a bed of lettuce with salsa, guacamole and cilantro. Make ahead tip: Prepare steps 1 through 3 and store in an airtight bag or container. Freeze for up to 3 months or refrigerate for up to 3 days before cooking.